Students learn better when they are actively engaged in course material. For the sciences, this translates into involving them in original research experiences. Research experiences for undergraduates in our research labs are a valuable opportunity for all concerned, but these spaces are limited. We may all acknowledge that providing research experiences for all our majors (and possibly non-majors) in science classes should be a goal, but large class sections and limited resources restrict access. 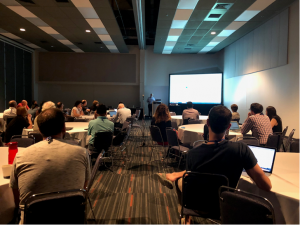 During the 2018 Education Workshop, “Incorporating Research into the Classroom” ASPB and the Canadian Society of Plant Biologists shared the venue to provide examples and inspiration for incorporating original research experiences into biology classes, both large and small, serving freshmen to seniors. Dr. Stan Roux, University of Texas, Austin TX, and Dr. Georgette Briggs, University of the West Indies, joined us to share tried and tested techniques and projects they have developed and used successfully in the classroom. Dr. Stan Roux, University of Texas, Austin shared experience gained over 30 years of having students do research in a senior level “Discovery Lab”. Dr. Roux shared experience gained over 30 years of having students do research in a senior level “Discovery Lab”. Students do simple experiments to address unanswered questions 1) highlighted in the Plant Physiology course he taught. [e.g., do Ca2+-channel blockers reverse growth promoting effects of cytokinin in Lemna (duckweed)?] or 2) more recently unanswered questions in his own grant-funded projects on gravitational biology and effects of eATP on plant growth and development. Students work in pairs to carry out four rounds of experiments per semester, each concluding with oral and written reports. Stan suggested the key to his success were 1) The lab experiments students carry out are truly novel, 2) The experiments required only techniques that students can readily learn and 3) allow for repetition and refinement. 4) The course professor cannot predict the outcome of the experiments, but can convince students that any credible outcome will be novel and significant. And finally 5) The course professor is genuinely interested in learning the results. The Discovery Lab was so effective, that UT has incorporated it in the freshman level biology offerings. 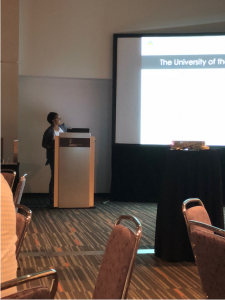 Dr. Georgette Briggs, University of the West Indies, shared the experiences of her department regarding their re-conceptualized approach to the inclusion of undergraduate research experiences across various biology disciplines in their programs. Dr. Briggs shared the experiences of the Department of Life Sciences at The University of the West Indies (UWI), St. Augustine Trinidad, regarding their re-conceptualized approach to the inclusion of undergraduate research experiences across various biology disciplines in their programs. Shifting focus from an apprenticeship-focused to a course-based research model allowed them to ensure that a higher percentage of graduating students had a meaningful experience of performing scientific research outside the confines of pre-determined lab exercises. Themed research projects are used that fall under the PI’s areas of expertise. This allows them to address scientific issues and challenges in our unique local environments, while simultaneously addressing the departmental research agenda. Their students’ responses indicate that this approach is proving a success. The Department also continues to see an increase in UG–involved scientific publications and in UG students transitioning into PG programs. It is clear through the presentations of Dr. Roux and Dr. Briggs that when educators are able to incorporate original research experiences into biology classes, students are able to learn better and are more actively engaged in the course material. These ideas are ones that we can and should implement in the classroom when able.